FREE PATTERN – Red Heart Scrubby Yarn Review! I received a package from Red Heart recently with some Scrubby yarn in the Citrus colorway! Find out what I thought about it and get the FREE PATTERN! I have never tried anything but cotton yarn for dishcloths and so I was intrigued. Scrubby is made from 100% polyester and cleans better than cotton. It also dries quicker than cotton too. Washcloths are another possible use for this yarn, because of the exfoliating properties. I wouldn’t recommend it for everyday use though, just a weekly exfoliation day. 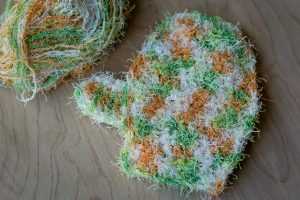 Scrubby is a great eco-friendly alternative to traditional sponges, washcloths, or paper towels. Simply machine wash warm and tumble dry low and your dish or washcloth is readyto use again. Each 3.5oz skein includes 92 yards and there are 25 colors presently available ranging from bright solids to colorful ombres and multicolored variegated yarns. 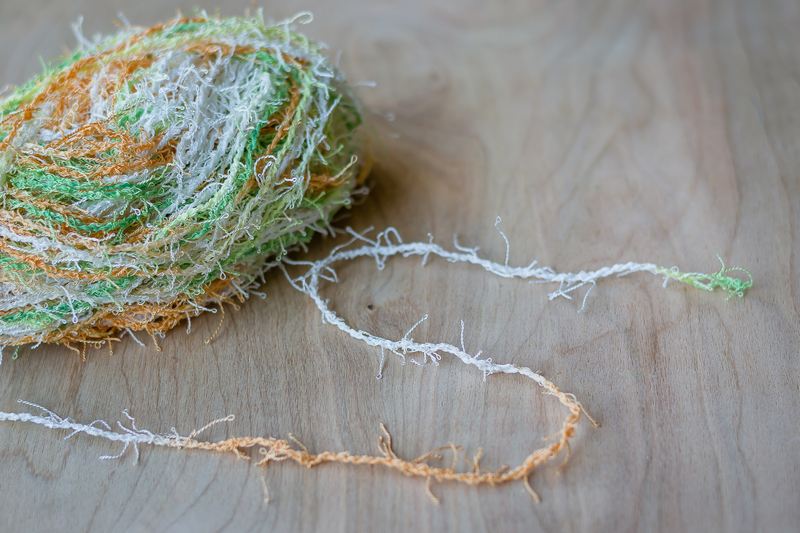 My skein of Citrus was a perfectly named variegated blend of lemons, limes, oranges, and whites. 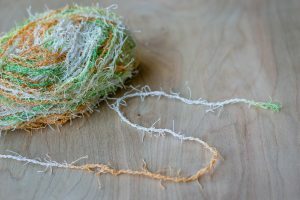 Scrubby isn’t your typical “yarn.” It is a heavy plied thread with small twisted threads intertwined. It is listed as a worsted weight but, that is because, when crocheted, the small twisted threads bulk up quite a bit. They also give the finished piece a unique texture suited especially well for cleaning. I started with an H hook, but ended up with a J hook because of this. 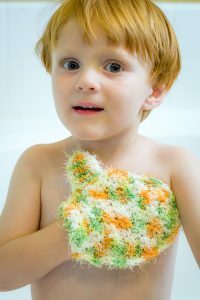 I designed the Scrubby Bath Mitt as a fun way for kids to get excited about washing up. I tried working my bath mitt in the round but it was very difficult to see the stitches. In general, Scrubby is much easier to work back and forth in rows.